This article first appeared in Personal Wealth, The Edge Malaysia Weekly, on April 1, 2019 - April 07, 2019. Areca Capital Sdn Bhd took home three awards at the 2019 Lipper Fund Awards from Refinitiv. For the second consecutive year, it won the fund awards for Best Equity Malaysia in the 3, 5 and 10-year categories. 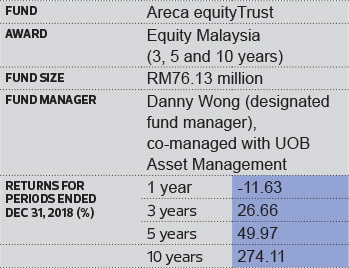 Danny Wong, CEO and fund manager, says Areca equityTrust was able to outperform its peers due to the firm’s investment philosophy, which takes into account market liquidity, investors’ risk appetite and the intrinsic value of underlying assets when making investment decisions. Wong says the speed of decision-making and execution also played an important role. For instance, the team could reduce its exposure to equities to below a necessary level fairly quickly when required. “Our fund is normally 70% to 98% invested in local equities and equities-related securities. However, in response to adverse market conditions, we can temporarily reduce the fund’s exposure to equities to way below its normal allocation],” he says. Last year was challenging, but the firm did not make any significant changes to its portfolio. The fund’s allocation to equities remained at 80% to 90% throughout the year and continued to hold stocks with strong fundamentals. However, the fund did take some profit in the third and fourth quarter last year. “We took some profit off our existing investments to buy into certain stocks and sectors that had been heavily sold off,” says Wong. This strategy showed results in the first two months of this year, with a return of 7.7% compared with the FBM KLCI’s increase of 1%. “We will continue to consistently apply our firm’s investment philosophy and fund strategy throughout the year. Our approach has been proven to work well in up and down markets since its inception 12 years ago,” says Wong. Wong expects the global financial markets to deliver positive performance this year. For one, the market correction last year brought valuations back to reasonable levels. Also, headwinds such as the US Federal Reserve’s monetary policy tightening and the US-China trade war seem to be subsidising. “If the trade war is resolved, the markets will gain more impetus to deliver even stronger positive returns,” he says. Some of the sectors that performed poorly last year, including construction and gaming, may see a stronger recovery this year, says Wong. Some stocks within these sectors were deemed oversold and value is emerging. “We also anticipate economic growth to remain healthy, which will benefit sectors such as banking and manufacturing, which are proxies to the country’s economic growth,” says Wong.